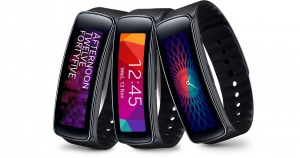 Samsung has just launched two new smartwatches, the Gear 2 and Gear 2 Neo, but the company also presented a quantifying bracelet along with the Galaxy S5. This bracelet monitors and quantifies your fitness activity, and in turn, it’s a complement to multiple devices of the Galaxy family. It has a similar style to Huawei Talkband B1, with a curved screen that fits comfortably in your wrist. The touch screen is Super AMOLED, 1.84 inches, with a resolution of 432 x 128 pixels. It has Bluetooth 4.0 LE and it’s powered by a 210 mAh battery, enough for 2 or 3 days of normal usege and up to 4 days of intense activity. In addition, like other devices that provided the company, the Gear Fit is resistant to dust and water, with an IP67 certification. The Gear Fit has dimensions of 23.4 x 57.4 x 11.95 mm and weighs only 27 g.
It also includes a collection of sensors to help you to get the most of our training sessions. Among them we can find a heart rate monitor, a pedometer, a calorie counter, a stopwatch, and a sleep monitor. The S Health application allows us to monitor our fitness activity. The Gear Fit is not only a complement to our training, but it also allows us to see the notifications received in our smartphone through Bluetooth. The control is very simple, and we can easily switch the screen dragging our finger across its surface. It offers an additional level of personalization with removable straps. We can easily change the belt, and for the moment, the Gear Fit will be available in three colors, gray, black and coffee. We will find it in the market on April 11, although Samsung has not announced the price yet.